Donald R. Taylor’s impressive commentary avoids all “end times” speculation – an approach practically unheard of by most interpreters. 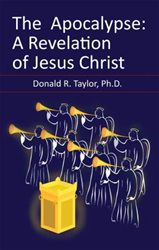 Donald R. Taylor, PhD.’s new book, THE APOCALYPSE - A REVELATION OF JESUS CHRIST, ($15.99, paperback, 9781498427036; $7.99, e-book, 9781498427043) clearly and understandably interprets all of the symbols of the Apocalypse, just as the first readers of John’s book understood them to be. The author believes that those who first received the Apocalypse obviously understood it, since it applied to them personally. Taylor’s aim has been to examine it through first century eyes, as much as possible. This commentary gives a clear interpretation of such symbols as the 144,000, the Beast, the False Prophet, the Mark of the Beast, 666, and Armageddon. Many other lesser symbols such as heads, horns, tails, stars, horses, trumpets, bowls, etc., are also interpreted. The historical circumstances of the Apocalypse are established: Gnosticism, emperor worship, the fall of Jerusalem, and the general persecution of the church. Donald R. Taylor, PhD. found Christ at age thirteen and began preaching by age sixteen. Realizing the need of a Christian education, he attended Freed-Hardeman University, where he studied under godly men and received a B.A., in Bible and Greek. He also received an M.A in French and a PhD in Comparative Literature from the University of Southern Mississippi. With his wife and first child, he served as a missionary to French churches in Belgium and in Montreal. Preaching for 60+ years, he served congregations in the U.S., while teaching on the university level for 30 years. He has written published commentaries on Galatians (in French only), Romans, and the Book of Revelation, in addition to this book. Having recently completed a Commentary On Daniel, to be published in 2016, Mr. Taylor now serves his congregation as an elder. Xulon Press, a division of Salem Media Group, is the world’s largest Christian self-publisher, with more than 15,000 titles published to date. Retailers may order THE APOCALYPSE - A REVELATION OF JESUS CHRIST through Ingram Book Company and/or Spring Arbor Book Distributors. The book is available online through xulonpress.com/bookstore, amazon.com, and barnesandnoble.com. Media Contact: Donald R. Taylor, PhD.